In 1802, the English poet William Wordsworth was ‘wandering as lonely as a cloud’ when he came across a sight that brought him such joy and pleasure that it inspired one of his best known poems. He had seen a ‘host of golden daffodils’ ‘fluttering and dancing in the breeze’. Perhaps the most instantly recognisable garden plant, this herald of spring still brings delight in British gardens, parks and the countryside. As well as being the national flower of Wales, the daffodil is a firm favourite with gardeners across the UK. A huge variety of daffodils have been developed. Cultivars are available for situations as diverse as traditional naturalised drifts in grassland and woodland, through formal perennial planting to miniaturised displays of tiny bulbs in stone troughs and other containers. The daffodil’s bright, sunny flowers appear from late March. They have a perianth of 6 petals, or more correctly tepals. Inside this is the corona, also known as the cup or trumpet, which surrounds the six stamens and a three-lobed stigma. This article looks at the selection of daffodil cultivars for the garden and how to plant and look after them. The native British daffodil, N. pseudonarcissus ssp pseudonarcissus, has pale yellow flowers, with a darker central trumpet. The long, narrow leaves are slightly greyish green in colour and rise from the base of the stem. There are other accepted subspecies, particularly in Spain, but there is disagreement amongst experts about the exact number. The best known is probably the Tenby daffodil (N. pseudonarcissus ssp. obvallaris), which originated in cultivation but now grows wild in south-west Wales. Classification of the species itself is complex, even before hybrids and cultivars are considered. There are eight recognised varieties of N. pseudonarcissus ssp. pseudonarcissus alone. Double-flowered specimens are occasionally found in wild colonies, with records going back to the 16th century when they were called ‘Gerrard’s double daffodills’ after a famous herbalist. In addition to the species and their natural variants, there are thousands of cultivated hybrids and cultivars of daffodil. More than 2000 daffodil cultivar names from ‘Abache’ to ‘Zilch’ were accepted onto the International Daffodil Register and Classified List between 2008 and 2017 alone. While many gardeners will be happy to buy daffodils in mixed bags from the garden centre, many enthusiasts prefer to use specialist suppliers when choosing their bulbs. Division 1: Trumpet daffodil cultivars with one flower to a stem; the corona as long as, or longer than, the petals. Division 2: Large-cupped daffodil cultivars with one flower to a stem; corona more than one-third of, but shorter than, the length of the petals. Division 3: Small-cupped daffodil cultivars with one flower to a stem; corona not more than one-third the length of the petals. 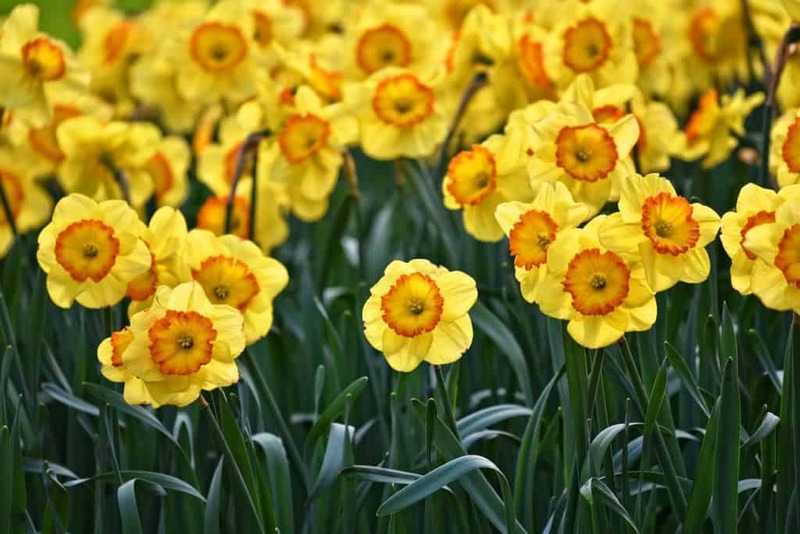 Division 4: Double daffodil cultivars with one or more flowers to a stem, with doubled petals, corona or both. Division 5: Triandrus daffodil cultivars, with two or more pendent flowers to a stem and reflexed petals. Division 6: Cyclamineus daffodil cultivars, with a single, short-necked flower on each stem, held at an acute angle, and petals significantly reflexed. Division 7: Jonquilla and Apodanthus daffodil cultivars with one to five usually fragrant flowers to a stem; petals spreading or reflexed. Division 8: Tazetta daffodil cultivars with three to 20 fragrant flowers on a stout stem; broad leaves; petals spreading, not reflexed. Some are only half-hardy. Division 9: Poeticus daffodil cultivars with pure white petals around a very short or disc shaped corona that is not more than one fifth the length of the petals; flowers fragrant. Division 10: Bulbocodium daffodil cultivars with one flower to a stem and insignificant petals by comparison with the corona; thin, rush-like leaves. Division 11: Split corona daffodil cultivars with the corona split for more than half its length. Division 12: Other daffodil cultivars that do not fit into any other division. Division 13: Daffodils distinguished solely by botanical name, that is, all species and wild or reputedly wild variants and hybrids. The letter or group of letters that follows the number represents the petal colour. It is described from the outside edge, then the middle, and lastly the inside next to the corona. The second letter or group of letters represents the colour of the corona starting from the eye-zone, then the mid-zone and extending out to the edge or rim. The letters are: W – white or whitish; G – green; Y – yellow; P – pink; O – orange; and R – red. These are some of the most popular varieties available. This is a free flowering, traditional trumpet daffodil that has very large, golden-yellow flowers. It is a versatile variety and does well in containers. The flower stems grow to 40cm tall and they are long lasting in a vase. This is another uniform, rich coloured daffodil with yellow petals and a matching yellow trumpet that is frilled and open at mouth. It an excellent choice for the border and for cut flower displays. The variety has been known for hundreds of years and it has the RHS Award of Garden Merit. It prefers a sunny location, well sheltered from the wind, and it will naturalise well when planted in grass or under tress. This variety has colourful flowers with creamy-white petals and a large corona that opens orangey-yellow, then fades to a delicate shade of salmon pink as it ages. It is an ideal variety for naturalising and the rich colours are boosted in drifts. ‘Arctic Sensation’ is a creamy-white daffodil with a soft fragrance. It makes a great border plant and it will grow well in patio containers, where its fragrance can best be enjoyed. It is a favourite variety for bouquets and the cut flowers last well in a vase. This is a very popular variety with yellow buds that turn white soon after opening. It is ideal for borders where it will naturalise, or it will do well in containers. Its scent and colour make it a great cut flower from March through to April. The flower of ‘Altruist’ has a very distinctive small, dark orange cup surrounded by apricot-yellow, overlapping petals, standing on 45cm tall stems. The flowers do well in a vase and blend well with yellow daffodils in a mixed display. The bulbs naturalise well, flowering reliably year after year and increasing in number. A beautiful double flowered daffodil with peony-shaped, deep-yellow blooms that are particularly good for planting in masses. This new variety has stunning, double-flowered, long-lasting, buttery-yellow blooms. Each flower has a ruffled centre with some vivid orange petals. Its sturdy stems grow to 40cm in height. The flowers are sweetly fragranced. A cyclamineus daffodil, and probably the most popular dwarf variety, ‘Tete-a-Tete’ will bear up to three flowers per stem. They bloom in early spring, and have neat buttercup-coloured trumpets that are slightly fluted at mouth. At just 20cm tall, it is an excellent choice for rockeries and patio containers. It is also available as a white variety called ‘Toto’. A spectacular, very fragrant variety with multiple, delicately marked, orange-yellow flowers with white edges. It is a shorter variety than most at 30cm tall, and it flowers in April when many others have finished. It is suitable for planting in borders, though it is generally used in containers or cutting beds. A Jonquilla division daffodil, ‘Quail’ produces dainty clusters of nodding, golden-yellow flowers. ‘Quail’ will naturalise if left undisturbed and will persist for many years. It is a late flowerer, from April into May. This poeticus variety, often known as the poet’s daffodil, is more than a hundred years old and will flower into late May, after many spring bulbs have long since finished. They have pure white reflexed petals and an orange-red corona. They naturalise very well, and will spread into large groups. They reach up to 35cm in height. This multi-headed Tazetta daffodil has been given the RHS Award of Garden Merit. It has sturdy, broad leaves and robust 35cm stems that support clusters of jolly, bright-yellow petals around a deep-orange corona in April. It will do well in borders, but its strong fragrance is best appreciated when it is grown in containers around the house and patio. The best time for planting daffodil bulbs is late September, though October should also be satisfactory. The bulbs need at least three months of cold temperatures at between 3ºC and 9ºC to promote flowering. When choosing daffodil bulbs at the garden centre, ensure they are plump, healthy and firm. Avoid any that are damaged, shrivelled or feel soft. Once home, plant them within a week before they start to sprout. When buying on-line, check that the bulbs are coming from reliable growers, rather than being collected from the wild, as wild daffodil populations are dwindling and require careful conservation. To create a naturalised daffodil meadow, select a well-drained area of grassland or deciduous woodland edge that gets plenty of early spring sunlight. The grass will need to be left un-cut until the daffodil leaves have died down, so a formal lawn near the house may not be the best choice. Plant the bulbs in drifts of similar kinds and colours, rather than mixing various types randomly. Within a drift, each bulb can be dropped from waist height and planted where it lands to add a more natural distribution. The planting hole must be made through the turf and at least 10cm down into the soil below. A bulb planter can be used, or for large plantings, some gardeners have made Heath Robinson devices that they attach to battery-powered drills. In a border, daffodil bulbs can similarly be planted randomly or they can be set out in rows as a display or for cutting. Rows should be 25cm to 30cm apart and the bulbs planted at 12cm to 15cm centres. The planting hole or trench should be deep enough for the base of the bulb to be 15cm below the soil surface. If the soil is heavy or if the garden has a history of bulbs suffering from basal rot, the hole should be dug 25mm deeper and a layer of grit placed beneath the bulb. Whether growing in grass or a border, insert the bulb the right way up and replace the soil, firming in gently to make sure no air spaces are left around it. Make sure the area is moist throughout the spring. 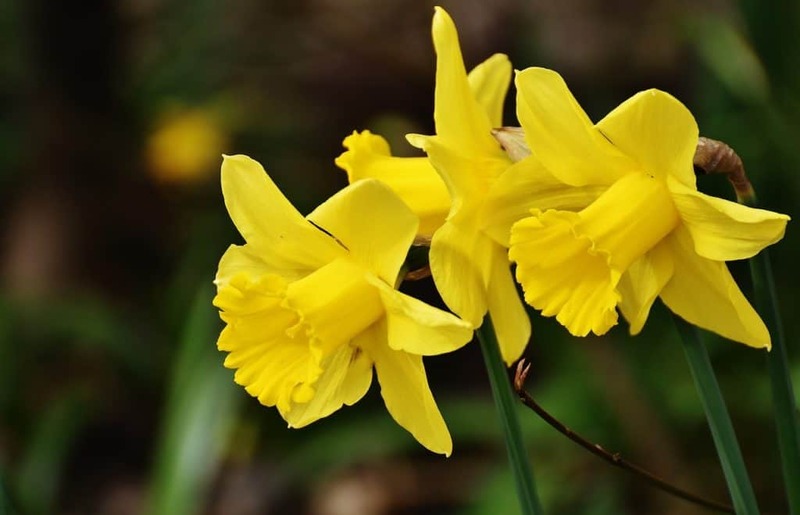 After flowering has finished, the daffodil’s leaves should not be tied into a knot, but allow them to die back naturally to feed the bulb for the following year. A bright, sunny position is best. A hillside or woodland edge with a southerly aspect is ideal. Daffodils require a good supply of water when they are growing in early spring, though they will not tolerate waterlogged conditions. The best soils for daffodils are well-drained, fertile loams with plenty of organic matter. The ideal pH is around 7 to 6.5, though they will tolerate a few units either way. Before planting, poor sandy or clay soils should be cultivated to a depth of two spades, with well-rotted manure or garden compost incorporated into the lower spit. Alternatively, heavier clay soils can be improved by raising the bed and incorporating plenty of sharp sand or grit. Many daffodil enthusiasts incorporate a general fertiliser when planting. This should be potash rather than nitrogen based to encourage flowers over foliage. High levels of nitrogen have also been implicated in the development of basal rot fungi. Prominent growers recommend a mixture of five parts by weight superphosphate, five parts bone meal, five parts sulphate of potash and one part hoof and horn, spread at 130g per square metre. Daffodils can make a great spring display in patio containers, but they need more care than those in open ground. Bulbs grown close to the edge of a pot kept outdoors are vulnerable to frost, so the size of container is important. A 25cm pot should be sufficient for three full-sized daffodils or six dwarfs, and the outside can be planted with a trailing plant to disguise the pot edge. There must be space and compost between the bulbs. Larger containers such as troughs and half-barrels allow more flexibility in designing a display and the bulbs are less likely to be affected by cold temperatures or drought. The container must be well drained, and filled with a general-purpose compost mixed with a generous handful of horticultural grit. The bulbs should be planted deeply enough to give them at least 1cm of compost cover. Keep the compost moist and protect them from frost over winter with 15cm of straw in a cold frame or by wrapping the whole thing with plenty of bubble wrap and wintering in a sheltered position. At the end of January in the north, or up to two weeks later in the Midlands and south, the pots should be removed from storage, the straw removed, and the developing foliage examined for any signs of disease. Put in a bright but protected place to green up the foliage and after a few days feed with a small amount of sulphate of potash, which should be well watered in. As the foliage develops, water progressively more frequently so that by the time the leaves are 50cm tall, the pots are watered every other day. Flowering containers can be kept in a cool greenhouse throughout, or moved onto the patio after being hardened off. Daffodils in a herbaceous border will provide early spring colour before the perennials start their summer display. They look good with winter aconites and tulips. Daffodils look best in drifts through the border; several interlocking drifts of different coloured daffodils can be designed if there is space. Daffodils are often used in formal bedding displays, especially in parks and recreation areas. Try them with primula, anemone, crocus, hyacinth, winter flowering heathers and Iris reticulata. Perhaps the best way to appreciate daffodils is as a naturalised meadow. Many types can be designed into the scheme, alongside other suitable plants such as the snake’s head fritillary, Fritillaria meleagris. Daffodils do not require pruning. Plants can be deadheaded, but the leaves should be allowed to die back naturally. With daffodils being cheaply and widely available, and bulbs multiplying naturally in the ground, they are seldom propagated at home. The species do produce seeds, and these can be collected and germinated, though they will take up to seven years to become a flowering plant. The bulbs can be ‘chipped’, a difficult process with mixed results that is nevertheless a useful tool for enthusiasts wishing to propagate a particular specimen. It involves removing the roots and ‘nose’ of the bulb and cutting it into about ten or a dozen sections (chips), each with a section of the basal plate. Daffodil blindness, when a plant fails to flower, has a number of causes. Growing conditions, pests or diseases may be to blame. Narcissus bulb flies are the main cause of damage to daffodil bulbs. The larvae burrow into the bulbs and cause flowering failure and ultimately death. There is no treatment and diseased bulbs should be destroyed. Container bulbs and those planted too shallowly or in loose soil are more likely to be affected. Slugs and snails may eat the young foliage. Daffodils are prone to various virus diseases such as yellow stripe virus. They are generally not terminal, but will cause reduced vigour, discolouration and distortions. Some seem to be associated with nematode attacks. The bulbs are also very susceptible to some fungal infections. Narcissus basal rot is a pinkish-white fungus that corrodes the base of the bulb. Leaf growth becomes yellow and the bulb may not flower. There are no chemical controls available. Bulbs should be removed and destroyed and the location should not be used for new daffodils for at least five years. Tazetta cultivars are generally more resistant, while the popular ‘Carlton’ and ‘Golden Harvest’ seem to be particularly susceptible. Narcissus leaf scorch causes reddish-brown blotching on the foliage and the flowers, especially in mild, damp springs. There is no known chemical control. Q Where can I see wild daffodils like those Wordsworth wrote about? Due to agricultural improvement and bulb collection, large populations of wild daffodils are now unfortunately quite rare. The best places to see them are probably along the banks of the River Dove in the North York Moors National Park. In the Forest of Dean in Gloucestershire, there is a circular Daffodil Walk Trail around woods and nature reserves. More details can be found at http://www.kempleytardis.org.uk/daffodil-walks.